Storage West West Phoenix is located on West Lower Buckeye Road in Phoenix, Arizona, this is to the west of downtown Phoenix. The nearest cross streets are 83rd Avenue and Lower Buckeye Road and we are located south of Interstate 10. 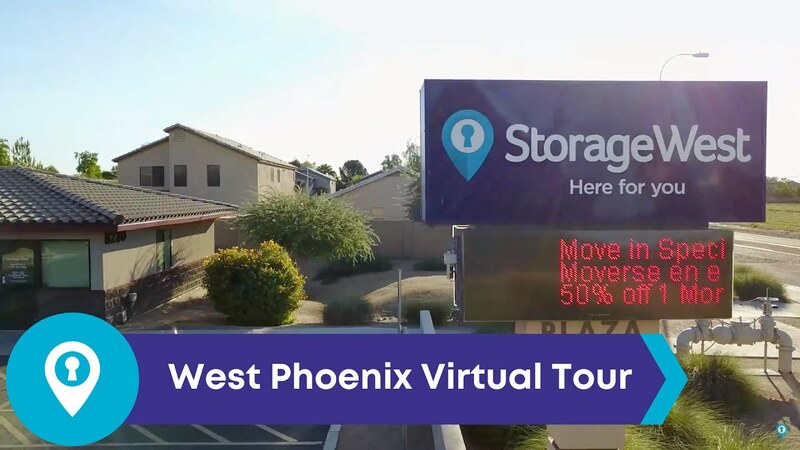 This is Storage West's West Phoenix Self Storage location, click here to see other Phoenix self storage locations. To find us use exit #135 which is the 83rd Ave exit from Interstate 10. We are 2.8 miles to the south of the Interstate. We are close to many interesting places including the Arizona Cardinals Stadium, Estrella Mountain Park, the Wildlife World Zoo and Aquarium, and the Pioneer Living History Museum. At our facility our tenants include both residential and business customers. Our property is very clean and well looked after. Our tenants like the focus on security – which includes cylinder locks on our units, computerized gate access and surveillance cameras to monitor comings and goings. We value our tenants. Storage West offer convenient air conditioned self-storage and mini-storage units in Phoenix with low prices for 5x10, 10x10, 10x20, and 10x30 storage. We have facilities across the U.S., with many convenient locations across California, Nevada, Arizona, and Texas; so when you search for: "storage units near me," you will find a local storage facility close-by. It's totally amazing to to find a business where you spend money and receive services, you paid for! Michelle is FANTASTIC! Kind, patient, personable and VERY PROFESSIONAL! I haven't received service like this! EVER! KEEP UP THE GOOD WORK STORAGEWEST!